Location, location, location. Great neighborhood and close to the city center. Great host, great location, good price. Apartment has all the facilities you need for a short stay. Friendly host - Rita was fantastic! Coffee pods and the wine was a lovely touch. Place is central. A great little apartment right in the middle of Lisbon. Rita was very friendly, and couldn't have been more helpful. The apartment is only a short, if hilly, walk from Rossio Square on one side, and Bairro Alto on the other. We'll be staying here again. Perfect location. Rita, the hoes,t was very accomadating and sweate. Location and hospitality was great. Real town center. Rita and Miriam very friendly and helpful. Location is great. Easy to access nearby tourist spot. Central location, helpful hosts, good home (sitting room, kitchen, small bathroom and bedroom) for a few days with good amenities, near some basic food shops and many restaurants but very quiet inside. Lock in a great price for Lisbon Historic Center Apartments – rated 8.5 by recent guests! One of our best sellers in Lisbon! Located in a 19th-century building, Lisbon Historic Center Apartments features apartments within 350 feet from the central Largo do Carmo, in Lisbon. It offers free WiFi access. They all include a living room and a TV, and some have a balcony. Bed and bath linen are included. The kitchen is fully equipped to prepare meals. The surroundings is filled with restaurants, Fado music houses, cafés and bars. São Pedro de Alcântara Viewpoint is 1,000 feet from the apartments and offers stunning views of Lisbon. 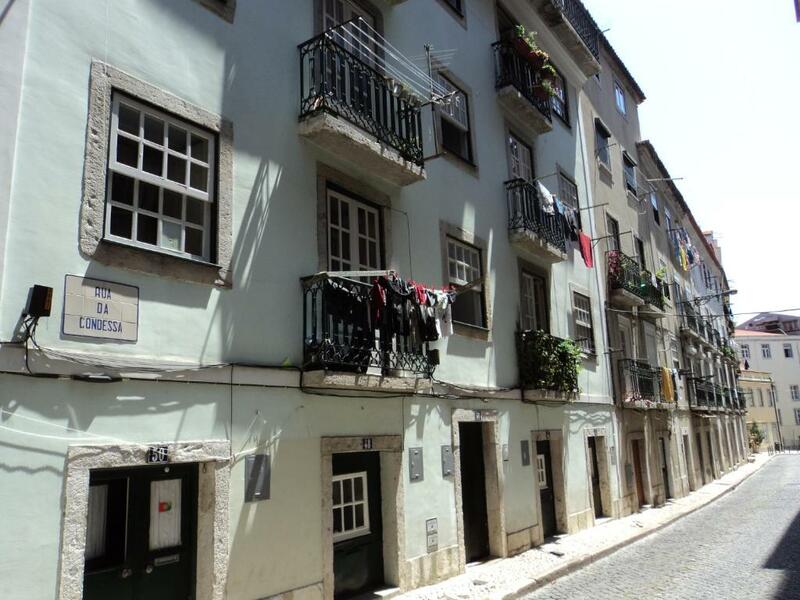 Bairro Alto is 650 feet away from Lisbon Historic Center Apartments. Guests can walk the 500 feet to Rossio Train Station and catch a train to Sintra, a UNESCO World Heritage Site. Baixa Chiado Metro Station is 500 feet away from the property. When would you like to stay at Lisbon Historic Center Apartments? Self-catering apartment with 2 double rooms, a single room and a sofa bed in the living room. This apartment is located in a recently refurbished 19th-century building. The apartment consists of a fully equipped kitchen, bathroom, bedroom with double bed, living room with sofa bed, towels and sheets. Nearby guests will be able to find cafes, bars, restaurants, fado houses and supermarkets. This apartment has a cable TV, kitchenware and microwave. Welcome to Lisbon Historic Center Apartments. Cozy apartments located next to "Largo do Carmo", in the heart of the historic center of Lisbon, offers you the best location and confort to visit our city. House Rules Lisbon Historic Center Apartments takes special requests – add in the next step! Please note that the 30% deposit charged on day of booking must be paid by bank transfer or Paypal. Lisbon Historic Center Apartments will contact guests with further details. The remaining amount will be charged in cash at check-in. Please note that late check-in after 22:00 is subject to an extra fee of EUR 15. Please inform Lisbon Historic Center Apartments of your expected arrival time in advance. You can use the Special Requests box when booking, or contact the property directly using the contact details in your confirmation. The bathroom could be better, and the kettle makes the electricity supply cut out. The boiler went out and it took about half a day to get a hold of someone to explain is how we could turn it back on again. Power kept on tripping when we used the heater or kettle. Up four flights of stairs. The apartment had a small amount of damp/mold in one bedroom. Good size and central location. The apartment had everything we needed, and the puzzles/games were good for the kids. They also provided a cot for us. The wine and chocolate on arrival were great! There is a small corner shop across the road which sells most things you might need. The host was very helpful and organised our early morning taxi pick up to go to the airport. We could have done with a small reading light in the bedroom. Perfect for our group of seven. Nothing in particular. We stayed in October and the weather was warm but not too hot. The apartment is "quirky" and excellent. Located on the 3rd floor with a balcony overlooking the narrow street. Lots of space (for two of us) and all the facilities needed for a comfortable stay. Watching life on the street with a glass of wine in your hand was great. By previous arrangement we met Rita at the apartment, unloaded the car and then returned the car to the rental company. A car in Lisbon is definitely not needed. Nice touches, a bottle of wine and some coffee capsules. The building is split into about 8 apartments on 4 floors. They have been converted to fit the space available. A few more of the buildings in the street are also being converted. The location is a few minutes from Rossio train station and the Baixa area. It's an easy walk up to the Bairro area. (Just note that anywhere in Lisbon is either up or down a hill/steps). The apartment was great to return to, relax, recover and go out again. We would certainly stay there again when visiting Lisbon. The bed was a little funky. It took up 95% of the bedroom making getting in and out awkward. It was so small, especially the bathroom was so small and dangerous also. Noise might be an issue. Either from outside or from upstairs.